Perth's residential real estate market is undergoing a significant structural change, with apartment developers hoping to reap the rewards. 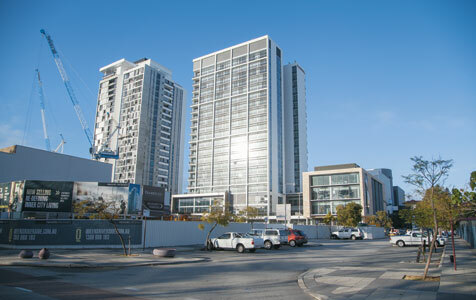 Long-winded, is a long time coming, necessary... New Perth apartments... When legislation comes into effect for only architects to design (types of) apartment buildings in Perth, Western Australia, sooner better than later, seriously... Architectural quality, style, the resident experience, public/local appreciation, industry recognition, etc. - will bring obvious positives into the Perth apartment building approvals, process, etc. development, construction, project marketing, sales & leasing markets... Bringing more to Perth's successful future residential in built / urban environments to suit our needs and wants to world standards. When we do get it right for a distinct Perth flavour, take that opportunity to focus work with Perth-based architects and practices. Australian (AIA) architects (not every registered architect is an AIA member) and Australian architecture, is not only for the 'high-end', also pioneer variety of developments for more apartment projects in the Perth suburbs... Unlike, for Satterley and the likeminded, may be their nightmare, fear / object to / criticise new concepts 'not in their interest' but so, they own how many (average-type) apartments as investment properties? No offence, but that road has been travelled for far too long (boring-buildings-anywhere, & Perth-urban-sprawl pun intended).